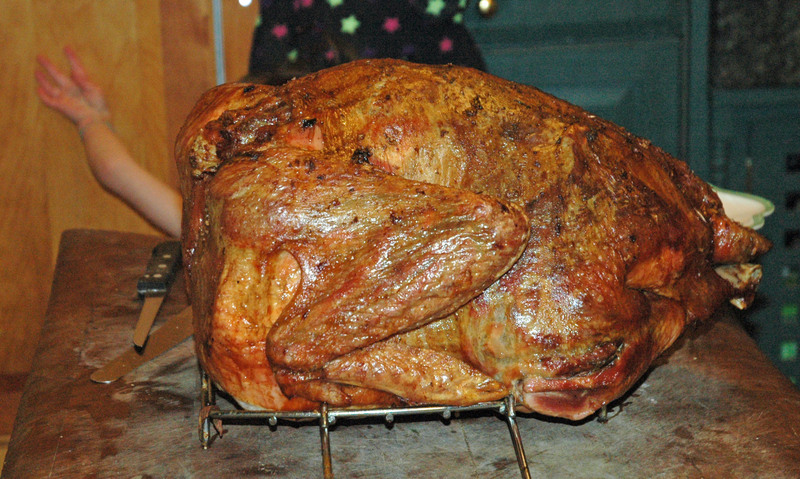 Don’t stuff your child in a turkey, take a photo and post it on your blog. It might draw the attention of Child Protective Services. Do be specific when asking your husband to get the biggest turkey at the turkey farm. Our turkey was 35lbs this year! When I asked Steve to get the biggest one from our turkey guy, he took me seriously! I hope you had a great Christmas and a wonderful holiday. A few days ago, I walked into the bathroom to find, once again, our lovely handmade soap bar soggy and squished with bits of brown soap all over the sink and the counter. UGH. I have lectured our little girls several times about wasting soap and even considered switching to liquid soap. However, I love handmade soap and I wouldn’t give up easily. It worked great. For those of you not into crafts, but having the same problem I was having might find this tip useful. I used a double layer of onion bag stretched around our scraps and secured with a twist tie. Highly functional, highly eco-friendly, but sadly ugly. Since I am always on the lookout for how I can use knitting to solve my problems in life, it wasn’t hard to come up with a prettier solution. I present to you the “Itty-Bitty Soap Scrap Sack”, using leftover sock yarn. Can you take more sock knitting pictures? Because I have to have someone to share them with! Here are some socks I did for my five-year-old. I did them with Cascade Fixation, which for those of you who don’t know, is a cotton yarn with some elastic in it. 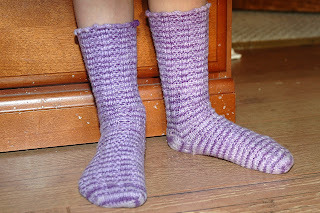 I thought I was a wool-only girl, but I just loved this yarn for kids socks. They are probably the best-fitting socks I’ve ever made. 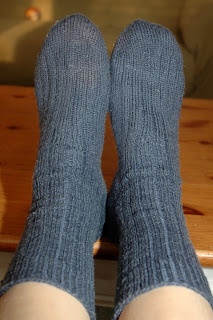 I did them toe-up in a basic 2 x 2 rib with a picot bind off. Here are Steve’s boring work socks all finished. They turned out well – fit great, feel nice and look good. These were a 3 x 1 rib (finished in 1 x 1 rib for 1 1/2 inches or so). I used this pattern, which is my new go-to sock pattern. Sigh. Why don’t guys like lace? I am the model in this pic, so the socks don’t fit as snugly as they do on Steve. And, some Basic Dude Socks I made for my dad for Christmas. I don’t think he reads my blog. I’ll have to warn my mom not to read this when my dad is in the room! 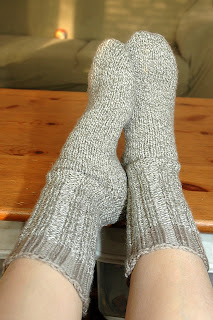 These socks are made with worsted weight yarn (actually, three strands of sock yarn twisted together). They knit up VERY fast. I could get used to this! Again, I’m the sock model here, so they look baggier than they will be on my Dad. And, that’s it for finished objects. 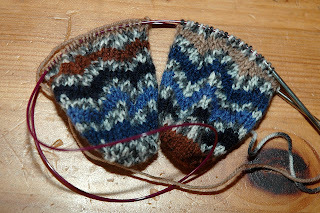 I’ve cast on some little socks for my baby for Christmas, which I think will also work up quickly, seeing as his little feet aren’t very big. Well, I’m off to knit! For a long time, I wanted to make our Christmas books ‘special’ by taking them out in December and giving them a dedicated place for everyone to enjoy. It would always be a pain in the neck to go around to our various bookshelves and try to collect them. Inevitably, some would be missed, or of course, misplaced! A number of years ago, I solved the problem by creating a special box they could be kept in. 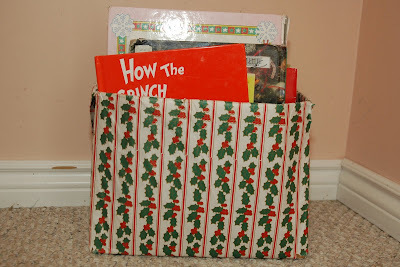 I keep the books in this box during the year on a shelf in our basement and when December 1st comes along, everyone is excited to take out the box. I like the idea of the box looking like a gift because I think books are a wonderful gift from God to His children. Woohoo!! Joyous Home is putting together a terrific-sounding treat for us that they are calling: “12 Days of Holiday Homemaking”, reminiscent of their wonderful magazine, Seasons at Home. Each of the 12 days will include freebies, such as: Holiday sewing, giving a Holiday tea, Holiday menu ideas, sweet treat ideas, Holiday bread making, traditions and more.